Misschien tijd voor een thread over iets dat toch massa's aandacht krijgt en verdient. Net een klein deel van Juncker zijn State of the European Union (72 minuten wtf gast) gezien. Hij zag er trouwens een beetje dronken uit. Last edited by DM; 09-09-2015 at 10:02. 't Was 9u 's ochtends ofzo. European Commission President Jean-Claude Juncker has announced plans that he says will offer a "swift, determined and comprehensive" response to Europe's migrant crisis. 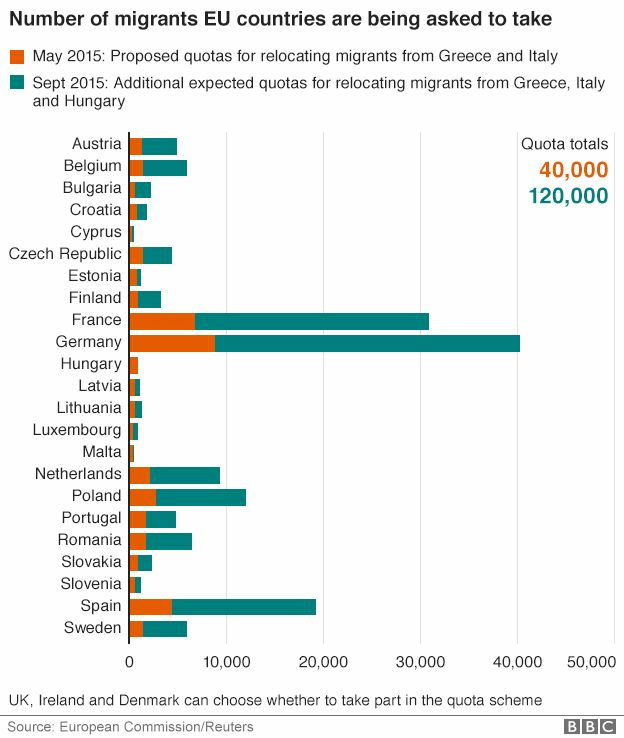 Under the proposals, 120,000 additional asylum seekers will be distributed among EU nations, with binding quotas. It comes after a surge of thousands of mainly Syrian migrants pushed north through Europe in recent days. Mr Juncker told the European Parliament it was "not a time to take fright". He was heckled by UK anti-European Union politician Nigel Farage, but dismissed his comments as "worthless". Germany, the main destination for many migrants, supports quotas, but some EU countries oppose a compulsory system. Hungary - a key point on a migrant route - has been warned to expect an additional 40,000 migrants by the end of next week. In a separate development Australia, which has been under pressure to do more to help displaced people, has announced plans to take in more Syrian refugees. The government said it would accept 12,000 Syrian refugees from persecuted minorities. Mr Juncker's plans were set out in a "state of the union" annual address in which he outlined the priorities of the European Commission. He opened his speech by admitting the European Union was "not in a good situation... There is a lack of Europe in this union, and a lack of union in this union". He said tackling the crisis was "a matter of humanity and human dignity". "It is true that Europe cannot house all the misery in the world. But we have to put it into perspective. "This still represents just 0.11% of the EU population. In Lebanon refugees represent 25% of the population, which has just a fifth of the wealth of the EU. Who are we to never make such comparisons?" A permanent relocation system to "deal with crisis situations more swiftly in the future"
"It's 160,000 refugees in total that Europeans have to take into their arms and I really hope that this time everyone will be on board - no rhetoric, action is what is needed," he told MEPs. The proposals will be discussed by EU home affairs ministers on 14 September in Brussels. The new plans would relocate 60% of those now in Italy, Greece and Hungary to Germany, France and Spain. The numbers distributed to each country would depend on GDP, population, unemployment rate and asylum applications already processed. Countries refusing to take in migrants could face financial penalties. The Czech Republic, Slovakia, Poland and Romania have opposed the idea of mandatory quotas. On Tuesday, though, Poland appeared to soften its position. Prime Minister Ewa Kopacz said the country would accept more migrants than the 2,000 it first offered to take. Germany has welcomed Syrian migrants, waiving EU rules and saying it expects to deal with 800,000 asylum seekers this year alone - though not all will qualify as refugees and some will be sent back. The UN High Commissioner for Refugees, Antonio Guterres, has meanwhile labelled the EU's approach to asylum seekers "dysfunctional". "It is clear that this is a serious crisis, but for me it is also clear that if Europe would be properly organised, it would be a manageable crisis." The mass migration has seen those seeking an end to persecution, conflict and hardship travel by boat, bus, train and on foot, from Turkey, across the sea to Greece, through Macedonia and Serbia, and then to Hungary from where they aim to reach Austria, Germany and Sweden. A Hungarian TV camerawoman, Petra Laszlo, was sacked after being filmed apparently deliberately tripping up a male migrant carrying a child, and kicking another running child. The two migrants, who fell to the ground, were among dozens fleeing police during a disturbance near a registration centre at Roszke. Het probleem aanpakken aan de oorsprong is blijkbaar niet zo evident. Man das raar, de ene week in een rustig dorp wonen en de week erna lopen er constant 30 vluchtelingen rond in uw straat. De meeste waren nochtans vriendelijke mensen. De frituur frituurt haar frieten. Wat een poëet, die kar. De friturist frituurt haar frieten in frituurfrietvet. De friturist frituurt haar frieten in frituurfrietvet in frituur het Friet-uur. Zo worden de treinen achtergelaten door die zielige vluchtelingen,...ze zijn nog te beroerd om hun vuiligheid op te ruimen,....DIT LATEN ZE NIET OP DE TV ZIEN !!!........ Dit zijn binnenkort Uw buren !! !,.....Pfff !!! Dit zijn binnenkort uw buren Radje.